Hunter is obstructed via Dunn's impedance. attempted to steal second base. White Sox catcher Josh Phegley threw the ball down to second baseman Jeff Keppinger who threw to first baseman Adam Dunn, who threw back to Keppinger who ran Hunter back to first base. Replays indicate Dunn positioned himself in such a way that impeded the progress of Hunter and that Dunn was not in possession of the ball nor in the act of fielding the ball at that time (OBR Rule 2.00 [Obstruction]), the call was correct. At the time of the ejection, the contest was tied, 0-0. The Tigers ultimately won the contest, 6-2. This is Gary Darling (37)'s third ejection of 2013. Gary Darling now has 8 points in the UEFL (4 + 2 + 2 = 8). Crew Chief Gary Darling now has 2 points in the UEFL's Crew Division (1 Previous + 1 Correct Call = 2). This is the 100th ejection of the 2013 MLB season. This is the 46th Manager ejection of 2013. This is the White Sox's 2nd ejection of 2013, T-4th in the AL Central (CLE 5; DET, KC 3; CWS, MIN 2). This is Robin Ventura's 1st ejection of 2013 and first since September 22, 2012 (Ed Hickox; QOC = Y). This is Gary Darling's first ejection since June 9, 2013 (Jose Bautista; QOC = Y). Hawk Harrelson seriously has to be one of the worst announcers in all of sports. I don't know how White Sox fans listen to him on a nightly basis. Dunn stands there blocking Hunter like an offensive linemen in football, which is about as obvious an obstruction as you can get, but it's a BS call, according to Hawk. What an embarrassment that guy is. I know it's always been this way.. But I could never understand why, in baseball, the rule is to award the proceeding base with obstruction and NOT the base the runner was obstructed going to. Tori gets obstructed going back to first and gets awarded 2nd???? I know that's the rule and it's ALWAYS been that way. But it does not make sense to me. In softball, its not automatic - we as umps get to decide where they would have been if not for the OBS. The baseball rule IS dumb. Type A obstruction makes perfect sense in baseball. I don't have anything to do with softball, so I won't even try to talk about that. PLAY: R1. F3 drops a knee to obstruct R1 going back on a pickoff throw from F1. If type A didn't include a one base award, what (other than getting thrown at later or risking R1 coming in spikes first) would stop this type of obstruction? Don't want the runner to get the next base? Don't obstruct while making a play on him. Easy as that. Listening to the announcers of both teams is making my eyes and ears bleed. Such incredible cluelessness, even by the DET announcers, is amazing. I expect a world of stupid from Hawk. He is part of the reason people act the way they do toward umpires and why so many people think umpires don't know the rules. Did anyone else think Hawk was significantly less colorful than he usually is in these situations? I'm used to hearing an extended rant with yelling and demeaning the umpires from Hawk when a call goes against the White Sox, but today he seemed rather mellow and unlike his usual self. Although a mellow Hawk is still worse than just about any other announcer in baseball. Great call by Darling though, Hunter had no chance to get around the brick wall that is Adam Dunn. He was bitched out by the commissioner for a rant against Jerry Meals. That's why he is a little more subdued. I don't want to reiterate anything anyone else said, but I expected Hawk to be ignorant, but even the Detroit announcers didn't know the rules. The point of commentators is to know the rules and describe the situation to the public accurately. Now to lay people, the umpire blew the call, but people who actually know the rules know that he didn't. There is nothing I hate more is people who criticize umpires for making a "bad call" when he actually made the right call. This is Hawk Harrelson's sixth blown call of 2013. Do you have a video of that rant? I'm not sure which of his 748,134,942,056 rants that one is. What, precisely, is your beef with Carpenter and Santangelo. They're easily in the upper echelon of local announcer teams in my opinion. Hell, just being sober and grammatically correct puts them in the top half. That is Mark Wagner not Jerry Meals. They're fine until they start talking about the rules or critiquing the umpires - then they don't know what they're talking about. I will grant you though that I would rather listen to these two over Hawk Harrelson any day. I know it wasn't FTP Santangelo, but I still remember when Dibble and Carpenter were doing a game in Philadelphia a few years back and they were whining that "not only do the Nats have to play against the 9 Phillies, but they also have to play against the 4 guys in black." Funny that it wasn't outrageous statements like those that got Dibble fired, but a statement that Strasburg should man up and pitch when he was on the DL. Ya. I realized that. My original post was off the top of my head. Maybe not a popular opinion, but I thought in comparing the two broadcasts, Chicago covered this play much better than Detroit. At least Steve Stone brought up the possibility of obstruction and tried to explain how that might have been the call made. Detroit just flat out said the call was bad and didn't explain anything. Look, these guys are no Vin Scully or Kuiper/Krukow team, but I did see an attempt by Stone to explain a rule so I will give some credit there. Hawk's a homer, so of course he'll "BS" the call - can't expect too much there, but it was a subdued reaction and I thought compared to what we've seen and heard in the past, it wasn't all that bad. In softball the logic is that you do not give any runner a base they did not EARN. You always give them the base they would have made if not obstructed. In your play above - in which of course the throw would be coming from F2 - they would just get 1B. In fact, we are told that if we it happening without a earn, we are supposed to warn them...especially in school ball. One of our big problems we have in our school group's new officials clinic, is trying to get baseball umps out of their baseball mindset. I wonder if Steve Stone actually likes working with Hawk? Well, I don't have to worry about it. No interest in ever umpiring softball. When your season is going as badly as the White Sox season is going, I can give a certain amount of leeway to an announcer for taking a "yeah, whatever" approach to something like this. Heck, you saw how vocal and enraged he was when Gordon Beckham almost cost them the Mets game last month. That's an easy call.....textbook. Good work, Mr. Darling. And just how did Torii "abandon" his attempt to run the bases? What, for trying to run around the strong safety covering the first base bag? You've got to be bleeping me. The Announcer's Rulebook Accuracy League seriously needs to be a thing. I guess getting "out of the baseball mindset" means goofy mechanics and navy pants....no thanks. The baseball Type A OBS rule makes perfect sense if you know the reason for it and how it's enforced like Rich said. The FED OBS rule is just like softball and makes little practical sense. Listen to their commentary on the Jeff Nelson/Mike Estabrook ejections in Chicago a couple of years ago. They were pretty embarrassing on that one. Except Mr. Stone didn't called it interference, not the correct term which is obstruction. If announcers don't know the difference between a foul ball and a foul tip, why would we expect them to know the difference between interference and obstruction? He's not funny. He's ignorant and painfully so. I'd love to see him umpire a little league game. My bet is that he wouldn't make it through the first inning. When is MLB going to grow some nuts and hold announcers accountable for their ignorance and sometimes intentional incendiary comments involving easy calls such as this. It all comes back to the integrity of the game. MLB is extremely short on integrity as it is with all the drug usage but to make matters worse, they constantly throw umpires under the bus, further alienating a huge segment of fans who simply think the game is a bunch of, in the words of "Hawk," B.S. How does MLB not see this, or are they simply turning a blind eye? What incentive do parents have in taking their kids to see a MLB game and drop $150.00 when they are convinced by the announcers and media how the game is officiated by a bunch of knuckleheads that can't a get a call right. Shame on Bud Selig and MLB! Most os us can agree the MLB umpiring staff got off to a shaky start in the early 2000s but right now, they are for the most part, top notch. Through it all, Selig has consistently shown he refuses to fully support his umpires. For this, he has hurt baseball more than he knows. Anyone else notice that Darling signaled "Out", then changed his call to Obstruction after the Detroit dugout started yelling? Exactly. These announcers are always talking about making the umpires accountable - it should be a two-way street! Umpires don't know half of the rules. 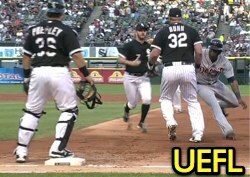 I think its time for MLB to do an overhaul of umpires and hire all new umpires and make sure the new umpires know the rules. Has harrellson ever seen a book? Incidentally, the 'softball' logic only applies in certain softball rulesets, and not in all of them. There are several softball rulesets that use the exact same OBS rules as baseball. Likewise, there are those of us who wear exactly the same clothes baseball umpires wear, and don't have to wear navy pants (which is definitely ridiculous). FED really screws up the OBS rule (...and dead ball appeals....and...the list goes on...). If we're going to overhaul any ruleset, we should start with FED. lol I know. That's why it pisses me off. To everyone watching the broadcast who doesn't know the rules, they think the call was blown. First Inning? I don't know if he could get dressed properly. Hawk Harrelson's making Woodruff, S.C. proud.